Every year around this time you’ll see them on most curbs – bags of leaves waiting for pick up by the bulk and brush trucks. Instead of sending these leaves to the landfill, you can recycle them at home, and turn them into a valuable soil amendment to put back onto your plants – leaf mold. You heard us right – leaf…mold…(though we prefer some important official organization rebrand it to “leaf gold”). 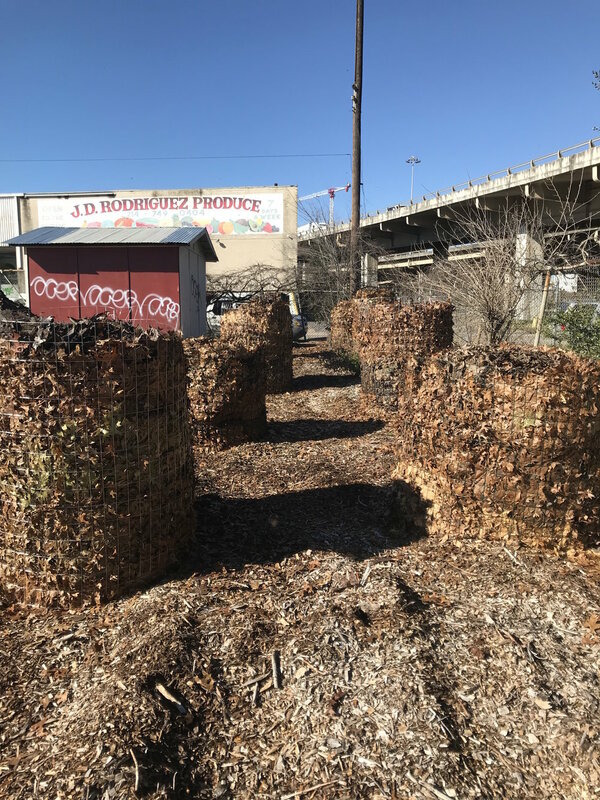 So, leaf mold is an incredibly valuable type of compost to create and harvest back into your urban yard. Soil that has leaf mold added to it can hold moisture 50% better than those without it (think about how valuable this is in our hot Texas climate). It creates better soil tilth (fancy word for structure), and it helps to attract beneficial microbes (a wonderful cast of characters inside the soil that we can’t see, but they are making magic at a microscopic level). Leaf mold is created simply by decomposing leaves, aided by fungal activity that is created when water and oxygen are combined with the leaves. Here’s the shorthand formula: leaves + water + oxygen + time = leaf mold. · 14 inch bolt cutters or a combo pliers/snip tool. · Roll of galvanized steel garden fencing material with 2x3 inch mesh opening. Now, to build your bins, simply roll out the fencing (we walked on it) until you have your desired length to create the circumference of the bin. Use your tool to cut the piece twice (once, along the vertical; second, along the horizontal edge). This creates a simple hook action that will make this cylindrical marvel. 1. Add leaves. Water that layer of leaves. 2. Repeat step one until you reach the top of the bin. Enjoy the step-by-step photos of how our team turned 2000 pounds of leaves from a community leaf drive into leaf mold bins. It sounds like a ton of work, but four ladies built all of this in four hours. We hope you will try this, too, in your urban space. We’ll keep you updated on the results of our leaf gold process and product as the year progresses.